For the enhanced version, see Shadow Warrior Classic Redux. For the reboot, see Shadow Warrior (2013). The game is free to download on GOG.com and Steam. The game was made open source in 2005. Technically doesn't have DRM but requires the game disk (or at least a bin/cue file) for music playback. Includes both expansion packs. Pre-packaged with DOSBox. Pre-packaged with DOSBox. Also available as part of Shadow Warrior Classic Redux. 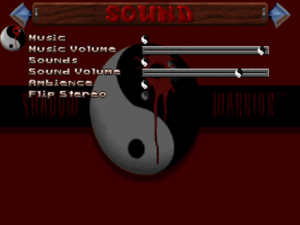 Uniquely, the shareware version of the game used MIDI tracks instead of CD Redbook audio in order to keep the download size small. 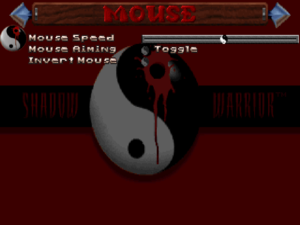 The European release of Shadow Warrior had the shurikens (throwing stars) replaced with darts due to their heavy usage in organized crime and gang activity at the time. As the ban on said content was later nulled, a patch to uncensore the game was later released. All digital releases are uncensored. There is a patch for the uncensored release that re-censores it here, useful if you find the darts more nostalgic. A batch file is used for toggling it on and off. For the GOG release, you may want to edit the bats or the autoexec part of the dosbox_swarrior_single.conf to make it also install to Twin Dragon. Free to play version of the game, published by Devolver Digital. It comes packaged with DOSBox and the base game, it's also the only version of the game that includes the Shadow Warrior's prototypes. Available for free, published by Devolver Digital. It comes packaged with DOSBox, the base game and the two expansions: Twin Dragon and Wanton Destruction. Bundled with the "3D Realms Anthology Pack", published by 3D Realms (not available to purchase anymore). It came pre-packaged with the base game, the DOSBox emulator and the two available source ports: SWP (choosed by default on the Steam launcher) and JFSW. Modern version of the game with remastered visuals and a remix of the main theme, published by Devolver Digital. Besides the remastered version (OpenGL), it also includes the base game and the two expansion pre-packaged with DOSBox. The game's third addon, "Deadly Kiss", was never released. Wanton Destruction can be found here. Twin Dragon level outpost can be found here and level refinery can be found here. bMouse is a DOS extension which improves mouse looking by removing the mouse filter which causes issues related to both axis not updating properly. bMouse will cause the vertical aiming to be inverted. 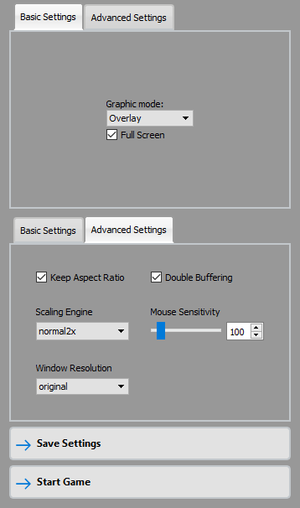 To fix this, go to the Setup Advanced Control Options from Control Setup, then at Advanced Mouse Setup change the Mouse Y Scale to negative number. DOS/32A is a more advanced extender and open source replacement to DOS4GW. It can improve both performance and stability of Shadow Warrior. All downloads for the game can be found on the official game site. SWP - Offers limited widescreen support (16:10 aspect ratio only), anisotropic filtering, vsync. JFSW - Allows for OpenGL rendering. Support high resolution textures. Use SWP (16:10 only; other widescreen aspect ratios are stretched). A source port is required. See Source ports. Use this script whenever you play Shadow Warrior. Could alternatively use a source port. Only works on Windows (no Mac, no Linux). Music slider does not work on version .74 of DOSBox. Sister build game Blood has a similar issue. Can be enabled through DOSBox's priority settings (use the pause emulation option). This game supports General MIDI for music. Via DOSBox IPX tunneling (the GOG.com version is pre-configured). Twin Dragon installs its self to Shadow Warrior by overwriting the original second episode, Code of Honor. The only way to get the original episode back would be to uninstall Twin Dragon. GOG worked around this issue by distributing two instances of Shadow Warrior with their version, one already "patched" with Twin Dragon located in the \dragon directory, the other "vanilla" version with Wanton Destruction in the root folder. However, this causes its own inconveniences as it requires its own private copy of the SW.CFG settings file. Settings usually have to be changed twice, once for vanilla, once for Twin Dragon. You could however make the game refresh Twin Dragon's .CFG from the main .CFG every time on start up to avoid this inconvenience and make both instances share the file in a sense by simply tweaking the autoexec. Open the file dosbox_swarrior_single.conf and under the :dragon part of the DOSBox config file, add the following lines after the #tdragon.exe but before the cls. Additionally you can keep saves between the two synced by adding COPY C:\*.SAV C:\dragon\ to the autoexec before starting SW.EXE and COPY C:\dragon\*.SAV C:\ after. GOG decided to make both the vanilla executable and Wanton Destruction refresh new copies of themselves with each run (Twin Dragon is unaffected by this issue). This imitates the functionality of the Wanton.exe utility included with the DLC but unfortunately causes an issue with using DOS32A's binding method as any modification to the executables will be reverted with next run. Copy wanton.dat and sw.dat to a new folder that you have write privileges in (GOG and Steam's installations are admin protected) and rename them to Wanton.EXE and SW.EXE. If you intend to play multiplayer then you should also copy Setmain.exe to this folder as well. Now bind them with the sb /r command. Restore their original .dat extensions and copy the files back now. Edit this game's DOSBox autoexec. Open the file dosbox_swarrior_single.conf and go to the sections :warrior. Duplicate the @COPY sw.dat sw.exe line and paste it beneath the sw.exe in the :wanton part. You could also avoid the above by simply attempting to bind DOS32A directly to the Wanton & SW dat files, though this generally has mixed results and may not work for everyone as the bind utility does not like files that don't have the .exe extension. Also note that because many of Twin Dragon's files are duplicates of the vanilla files, the setmain.exe is exactly the same for both and can be merely be copied over to Twin Dragon's directory after binding. This however should not be done to Twin Dragon's sw.exe, as mentioned above it is different from the vanilla version and thus should be bound separately. 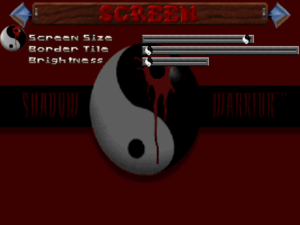 Make sure DOS32A is copied into your Shadow Warrior folder. Also revert any changes you did with the last method (you can accomplish this with the verify/repair option in GOG Galaxy). 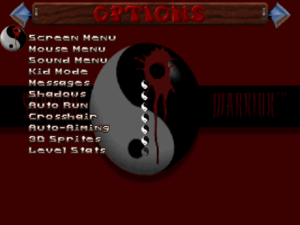 Start Shadow Warrior with DOS/32A by using the command DOS32A followed by the executable name, i.e. SW.EXE for vanilla. Edit these commands into your DOSBox autoexec. For Twin Dragon, use the command C:\DOS32A instead, specifying DOS32A's location (root folder). A similar method may be needed for making bMouse above work with Twin Dragon. Because of financial issues, developer decided to ship Twin Dragon without its music track. Unfortunately they also disabled the music completely in the process. You can patch its included SW.EXE with this to enable the music again. Slope-tilting if a feature of many build games in which the game will automatically rise or lower the camera when going up or down a slope. Though helpful for those whom use arrow keys to move, it can be very annoying for those who are used to WASD + Mouse for look & movement. Unlike earlier build title, Blood, Shadow Warrior does not provide an option to turn this feature off (not even in source ports). 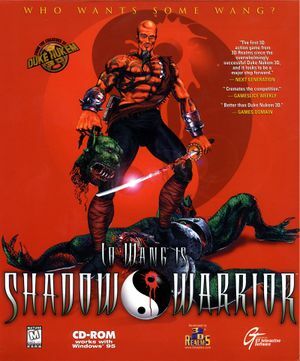 An unfinished beta patch for 3DFX can be found on Shadow Warrior's official 3D Realms download page. It is based on the version used by sister build game Blood, though with additional fixes. Default mode in DOSBox and only mode in classic version (without 3Dfx patch). ↑ 2.0 2.1 File/folder structure within this directory reflects the path(s) listed for Windows and/or Steam game data (use Wine regedit to access Windows registry paths). Games with Steam Cloud support may store data in ~/.steam/steam/userdata/<user-id>/358400/ in addition to or instead of this directory. The app ID (358400) may differ in some cases. Treat backslashes as forward slashes. See the glossary page for details. This page was last edited on 23 December 2018, at 06:53.